….I like drawing things rampaging. It’s incredibly fun! I need to remember to turn off f.lux before I colour though- I keep getting these washed out things instead of the warm colour schemes I set out to do. D’oh! How’d you get shoes in that a big size? I read this while tired right after waking up, and I definitely thought for a minute that you were riding a giant-sized skateboard of destruction in the third panel. Oh how I ponder the woes of short people. I myself haven’t been short since I was a wee lad, trotting through the rolling fields of Gurahmar. Things were much simpler then, but often out of reach. I have never been clotheslined. @RTgrl ~ you have an upside-down smiley face on your chin. Did you know that? Noticed the Two GAG shirt. Approved. No but seriously I love your whole comic. I’ve got a question for you as you love cats. Where do cats come from? I prefer the Costco hotdogs… I miss having an accessible Costco. Holy cow, I just realized I haven’t had a zit in a few weeks. Am I finally a grown up? 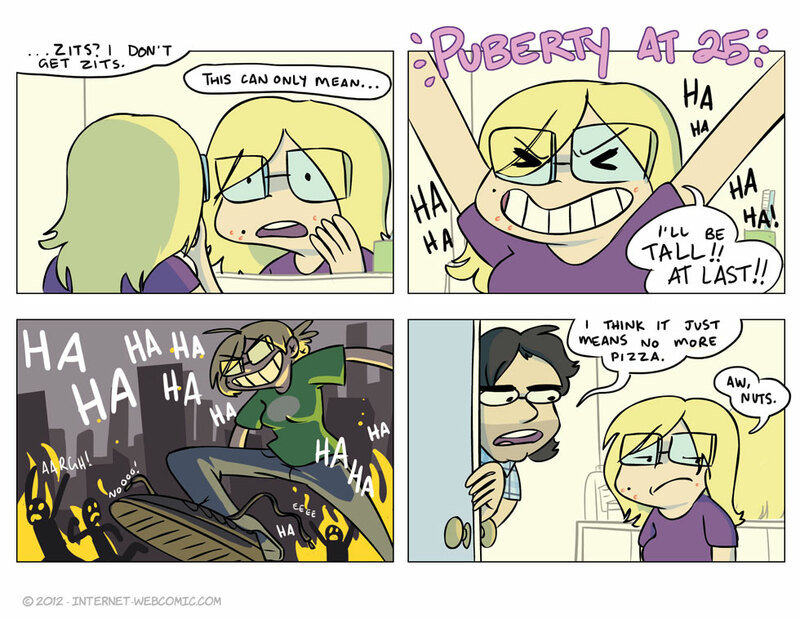 Also, I think the puberty fairy hates me, since I got zits and facial hair but barely any taller.